Vickie loves this photo of Josie and Melissa. And, so do I. Notice both Josie and the Foodog are in the same pose! I’ve spent the past several days compiling photos, sent to me by various people, from National Specialty week. In about a half hour, I’m out the door for a quick road trip to meet up with Julie in Lincoln, Nebraska, collect several dogs including Edie Bedie, dog talk and celebrate Fernando’s accomplishments. In the meantime, enjoy these photos. Josie & I had a grand time at The National!! Thank you Julie & Vickie for letting me share the room. Yes, Josie decided to visit and provide the entertainment in the agility competition, well, you just gotta laugh. She made up for it by being absolutely on her game in Friday’s Open Class. To be surprised by Melissa having Josie entered in agility was just one more wonderful thing to happen for me at this National. The first time I saw Josie I remember telling Melissa how intellegent Josie was and she was going to have to keep Josie occupied so she didn’t get bored with showing. Josie, like her half sister C’est la vie NEEDS to be the center of attention. Connor, both of their dads, is proving that lhasas can be people pleasing (on their terms, of course)He is consistenly throwing not only beautiful puppies, but puppies full of self confidence. I am so proud that Josie is setting the bar high for all his up and coming offspring. 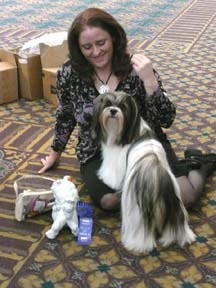 I only wish I had the time to dedicate to training some of my lhasas in agility or rally. Melissa and Mary you need to keep showing the public the versatility of the lhasa.